Rotterdam Thrash band THANATOS tend to stand out from the crowd with some inventive songs. 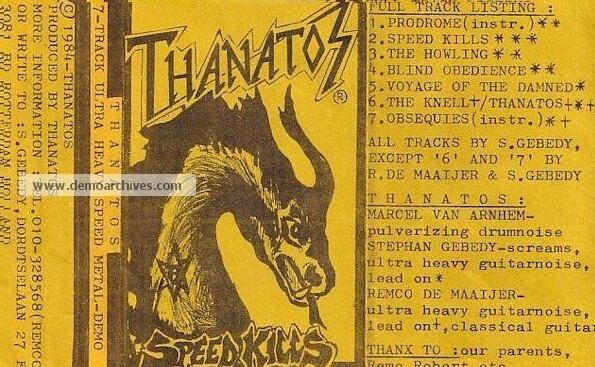 THANATOS actually lay claim to being Holland’s first Death Metal act having formed in 1984 with a line-up of Stephen Gebédí, guitarist Remco De Maaijer and drummer Marcel Van Arnhem. This version of the band released the ‘Speed Kills’ demo prior to folding in 1985. 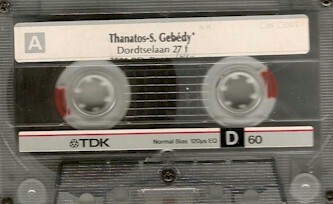 Gebédí reformed THANATOS for another demo session entitled ‘Rebirth’. Van Arnhem returned along with new bass player André Scherpenberg. Rob De Bruijn would take over the drum stool but departed soon after. Another new recruit in 1987 was former SECOND HELL guitarist Mark Staffhorst. Scherpenberg quit to join VIGILANT, necessitating KILLER FORCE guitarist Erwin De Brouwer to handle bass guitar. However, soon De Brouwer would shift to guitar as Ed Boeser of KILLING ELEVATOR maneuvered into the bassist's job. 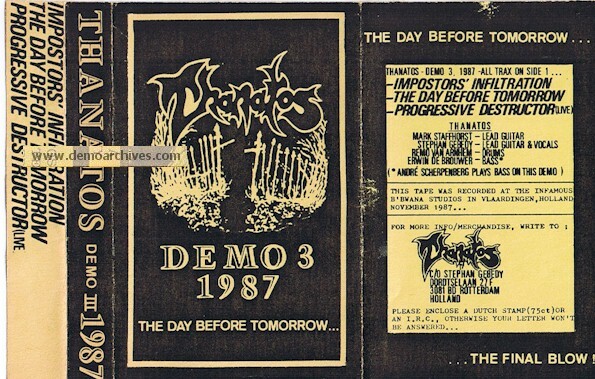 The group issued a 1987 demo entitled ‘The Day Before Tomorrow’, notable for featuring the live track 'Progressive Destructor’ and followed this with a 1989 tape ‘Omnicoitor’. Following their album for Shark Records, ‘Emerging From The Netherworlds’ produced by Ulli Pösselt, they released another demo in 1991(no cover) featuring five tracks before Shark came up with a second record, the Pösselt produced 'Realms Of Ecstasy', in 1992. 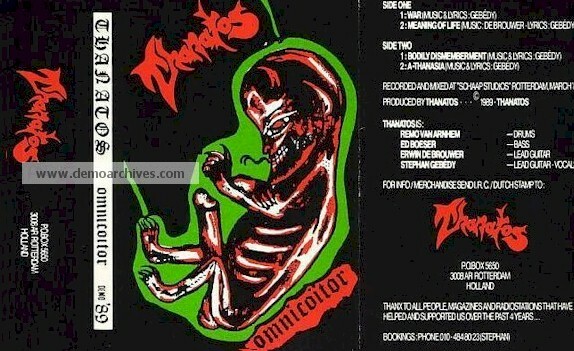 Demo covers pro printed (color), no lyrics, first 500 or 1,000 tapes were pro printed.